Rare-earth magnets are strong permanent magnets that are made from rare-earth elements. Two examples of rare-earth magnets put into practical use include Nd-Fe-B magnets and Sm-Co magnets. Among the two, Nd-Fe-B magnets are known to have the strongest magnetic field among commercially available magnets currently on the market. It is this strong magnetism which makes the development of smaller products possible, thus they are widely used in many applications in modern-day products, such as automotive control motors and vibrate features of mobile phones. 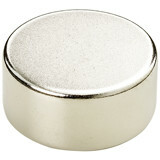 Has high magnetic flux density and extremely strong magnetic field. Mechanically vulnerable and its magnetism varies with temperature change. Can be used in temperature of up to 80 degrees Celsius, and applications to withstand higher temperatures are also available. Prone to oxidation, they are usually treated with coating of nickel of epoxy resin for protection. Nd-Fe-B magnets are used in many smaller applications such as vibrators in mobile phones, hard disk drives, CD players, and headphones, and also in much larger applications as well, such as automotive control motors, trains, hybrid vehicles, and drive motors for elevators. 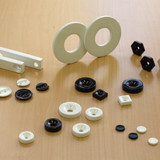 Round, Square, or Ring, we have a wide variety of Nd-Fe-B magnets available in all shapes and measurements in stock. Shipping available within 24 hours of order. We have Nd-Fe-B plate catch with a hole for countersunk screw bored directly on the magnet, and spherical Nd-Fe-B magnets with gold plate coating. A completely new neodymium magnet made by polyamide coat (powder coating), which improved environmental resistance characteristics at each step compared with conventional plated products.